Protesters (L-R) Margaret Meak and Heidi Majanen both of Kinlochbervie and Christina Perera of Strath Brora. Kinlochbervie protesters were left shell-shocked yesterday after their efforts to protect their toilets from closure were dismissed in scathing terms by Highland Council’s leader. 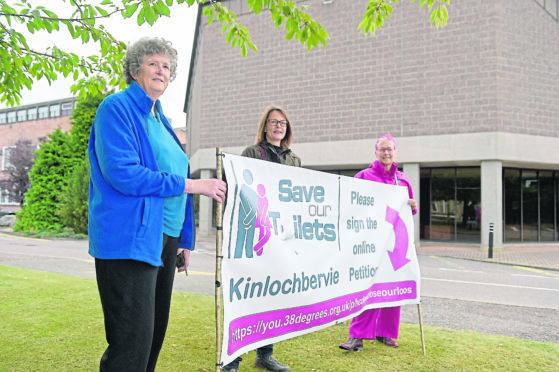 A delegation from the Sutherland village had travelled to Inverness to hand in a ‘save our loos’ petition of almost 14,600 signatures on the morning of a full council meeting. Council leader Margaret Davidson said people had been ‘wound up’ to sign the petition, claiming “98% of them were from overseas, outwith the area, or suffering from conditions like Crohn’s disease”. She said they had been given a negative picture of a proposed mass closure of toilets, and went on to make a personal attack on Kinlochbervie resident Margaret Meek, who has conducted in-depth research on the vital importance of public conveniences in north-west Sutherland. Ms Meek has also questioned the figures upon which the council’s drive to close toilets were based. While she conceded that communications at the start of toilet rationalisation were not good, she said: “We have businesses and communities coming forward to take over their toilets, comfort schemes are working well. Addressing Ms Meek, she said, “So what I suggest you do in future if you see something like this coming is, one, inform yourself, two work with your communities to find solutions instead of organising protests, because that’s what this has been. After the debate Mrs Meek said she felt shaken by the personal attack. She said: “I’m disappointed that Highland Council weren’t respectful of how people are feeling. Ms Currie asked council thorough a motion proposed in response to ‘the enforced closure of public conveniences across Highland in order to provide savings as dictated by the Revenue Budget earlier this year” to effectively take toilet rationalisation out of the budget cuts agreed in February, look at alternative, commercial solutions and present a report to a future meeting of the Environment Development and Infrastructure Committee. Her motion was opposed, and ultimately defeated 43 votes to 20, by an amendment from councillor Allan Henderson. Mr Henderson suggested a report should result from this, going to the environment, development and infrastructure he chairs.